The TX-20066 Coldspring-Oakhurst High School Air Force JROTC unit was visited on Thursday, Oct. 11th, by the Academic Credit Liaison for all AFJROTC Programs, Michael L. Wetzel of the Holm Center Academic Affairs Directorate. 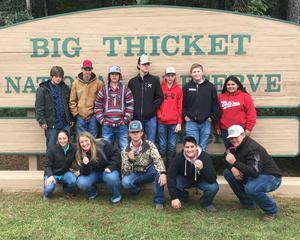 On Tuesday, Oct. 16th, three Coldspring FFA Wildlife Teams traveled to the Big Thicket National Preserve in Kountze to participate in the District FFA Wildlife Contest. COCISD Child Nutrition Specialists are serving up delicious local produce as part of the Texas Department of Agriculture's 2018 Texas #FarmFreshChallenge. Kitchen managers are developing recipes to serve up yummy side dishes such as roasted acorn squash. 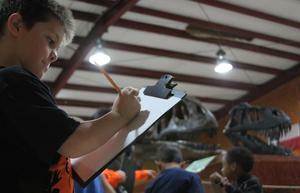 COCISD strives to provide the best education we can for our students. If you have a student at COCISD, let us know how we're doing, how you think we can improve, and how we can best help you. Complete the 2018-19 Parent/Guardian Survey today. It's located on the district website at www.cocisd.org > Resources > Parent/Guardian Survey 2018. The survey will be open through October 31, 2018. It will be a solid week of Trojan Pride starting Monday, Oct. 8th. From dress-up theme days to the Starry Night Homecoming Dance, join us as we celebrate the 2018 Trojan Homecoming Week. Click the 'Show More' link below for the full schedule. Because of the poor field conditions at Trojan Stadium due to the rain, all football games today will be played at Crockett, which has a turf field. 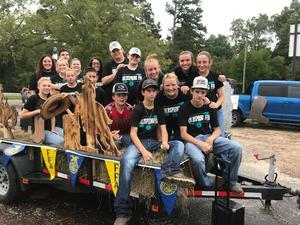 The 7th grade game has been moved up to 4 p.m., 8th grade will play at 5:15 p.m., and JV will play at 6:30 p.m.
Our Coldspring FFA, Jr. FFA and 4-H members had great showings at this year's San Jacinto County Fair & Rodeo. Click the link below for a complete list of winners. There will be no early dismissal today, Oct. 16th, and all after school activities are going on as usual. We are continuing to monitor the Dam output, which is currently at 80,300 CFS. At this time only one bus route may possibly be affected, the one that goes to the river bottoms area of our district. We will notify you of any changes as soon as they become available. 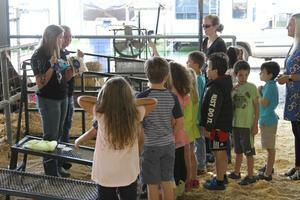 James Street Elementary students enjoyed a visit to the San Jacinto County Fair & Rodeo's livestock exhibits on Tuesday, Sept. 25. Coldspring FFA members were on hand to guide the tours, give presentations and answer questions. 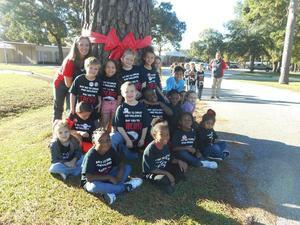 Students in grades Pre-K through 2nd were able to see goats, lambs, swine, horses and more. It was a great time for everyone!